Your videotapes will never look the same again! Studies have shown that VHS and video tape quality starts to degrade rapidly after 10 years even under ideal conditions. Furthermore, quality is lost each and every time your video tape is played. This may result in video dropout, loss of color, or even worse Sticky Tape Syndrome. This may go unnoticed until it is too late. Don’t let this happen to you, Let us Protect your Precious Memories by converting your videos and VHS to DVD! DVD’s can be played over and over without any loss of audio or video quality. However, they can be scratched or broken which is why we recommend ordering a backup DVD copy. By transferring your camcorder tapes, video tapes and VHS to DVD, your videos will last a lifetime. 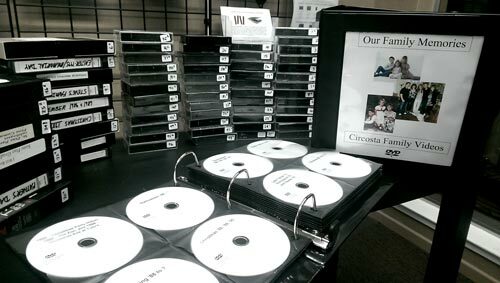 We create DVD’s utilizing the DVD-R standard, which is the most compatible recordable DVD format to date. We use the very best and most expensive DVD-R discs (Taiyo Yuden – made in Japan).Thus, you can be assured that your DVD will be as compatible and reliable as possible. We print directly on disc in full color, not on a paper label. Paper labels tend to throw off the balance of a DVD at high RPMs resulting in digital dropout of your video. We can transfer or convert VHS-C, Hi8, D8, 8mm, Video8, Betamax, DV, mini DV, DVCAM, 3/4″ Umatic SP, Betacam SP, HD, HDV, and VHS to DVD. Also, many people ask us if we can copy VCR to CD but what they really mean is can we copy VHS tape to DVD? The answer is Yes! Furthermore, we can transfer your iPhone to DVD or your iPad to DVD. We recommend no more than 2 hours of video per disc. 1 hour of video results in the highest quality possible while 2 hours is still very good. Any more than 2 hours results in a lower bit rate than desirable, producing a drop in resolution. Let us consolidate your VHS and camcorder video tapes to DVD Today! Want to Edit your Videos? AV Workshop can digitize your videotapes to high quality uncompressed digital computer files so you can edit them the way you want on your computer! For the PC, we convert to AVI files and for the MAC, we convert to Quick Time files. Uncompressed AVI and Quick Time files yield the best quality and compatibility available. We can provide these files to you on an external hard drive that you simply connect to your computer via USB and start editing. Thus, you don’t have to worry about buying expensive playback equipment or the long tedious hours it takes for digitization. Can I Edit from a DVD? Most people think that since a DVD is digital, they will be able to edit their footage directly off the DVD from within a video editing application like iMovie or Adobe Premiere. While this may be possible with certain DVD ripping utilities, we strongly advise against it. The reason is that video on DVD is compressed to begin with; therefore, if you edit already compressed footage and then author a new DVD from the already compressed footage you will end up with a highly re-compressed image that will be noticeably different than your original video tape. The end result will be a pixelated de-saturated soft image. Moreover, DVDs are closed discs that contain .vob files inside a video TS folder. They are not a single file that you can work with. If you simply drag the files off the disc (like most other companies recommend), you will have audio gaps where the clips line up and the audio might even become out of sync the further you get down the timeline within your video editor. Thus, we recommend that you have us create uncompressed digital computer files such as quick times and AVI files. By using quicktimes and AVI files, you could edit and re-export the footage to as many AVI or quicktime files as you want without any loss of quality. Quicktimes and AVI files are not only higher in quality; they are the most compatible file type to work with in your editing application. Meaning, you will be able to work with the video in real-time without having to transcode the video beforehand. Sticky tape syndrome (sticky shed syndrome) can happen to video tape within 15-20 yrs. It is a result caused by deterioration from the binder (glue) in magnetic tape, which contain the iron oxide covering to its plastic carrier. This deterioration makes the tape useless. Some types of binder are known to stop working overtime, due to the absorption of moisture (hydrolysis). The signs of sticky tape are immediately obvious, for the tape will not play or rewind. Often the reels of the tape squeak or screech. We are seeing more video tapes come through our shop with the sticky tape syndrome. Please do not let this happen to your tapes; bring them into Audio Video Workshop before it’s too late! In the event that your video tapes have expired and have developed sticky-shed syndrome, there is hope. We might be able to rescue your precious memories by baking the tape. Baking temporarily restores the video tape by driving the water molecules from the binder so that it can be quickly be transferred or digitized to a DVD or Hard Drive. While our Gold Video to DVD Transfers include the removal of gaps, ground-shake, and TV snow, we can also perform custom video editing for you. Maybe you want to remove unwanted footage from your wedding video, or maybe you want to combine your video tapes with photos and slides. The skilled editors at AV Workshop can perform just about anything you want including 2D Effects, credit rolls, photo restoration and audio restoration as well as the removal of uncle Jay after too many beverages…Custom digital video ediing is just $60 per half hour and is done by appointment. How many tapes fit on 1 DVD? We can compile multiple tapes onto 1 DVD at no extra charge. However, while we can fit up to 2hrs of video in good quality on 1 DVD, 1 hour of video on 1 DVD results in higher quality as the bitrate is 8mbps. In order to fit a 2hr tape onto a DVD we have to reduce the bitrate (quality) to 4mbps. Therefore, while it may be more convenient to have multiple tapes on a single DVD the quality will suffer over 1 hour. As a result, we recommend keeping your tape to DVD conversions separate – 1 tape per disc to allow for the maximum quality possible. Do you charge per tape? Yes we charge per tape as long as the tape is under 2hrs. What if my tape is over 2hrs? If your tape is over 2hrs we will have to transfer it to a second DVD which you will be charged for. It is rare that tapes run over 2hrs. What if my tapes are short? Is it the same price? We charge per tape up to 2hrs (per tape). Therefore, if you brought in 2 tapes 1st tape 5min and 2nd tape 2hrs, they would be the same price for each tape. What if my tape is empty? We do not charge you if your tape is blank. What type of media do you use? We use the highest grade DVD-R stock from Taiyo Yuden and Verbatim. This is the very best media available and is the most costly. These DVDs are rated at 100years data integrity. My tape is broken, can you repair video tape? Yes we can. Video tape repair costs an extra $20 and requires a transfer to DVD or file such as AVI or Quicktime. We do not just repair video tape, for the repair is only to egt the tape in a state where it can be digitized. Can you convert a PAL videotape? Yes we can. PAL conversion to NTSC (the american TV standard) costs an extra $10. Can I copy the DVD? Yes, we do not put any copy protection on your video. However, we cannot guarantee that you will be able to copy a DVD as there are many variables involved when duplicating a DVD and making it compatible with DVD players and computers. Thus, we offer DVD copies at just $10each..
Can you copy VCR to CD? VCR stands for Video Cassette Recorder and CD discs are meant for audio recordings (not video). However, most people actually mean to ask if we can copy VHS to DVD and the answer is Yes! Do I get my tapes back after they are transferred to DVD? Absolutely, your videos are given back to you along with the DVDs. We accept walk-ins as well as shipments. 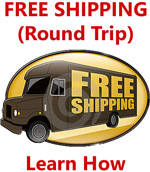 All online orders over $200 qualify for FREE round trip shipping! To learn more Click Here. You can get an Estimate or Order online by clicking Get Started above. You can Order Online and Ship Us your Project or Drop it off Locally. We Serve: Peninsula - San Mateo County, Atherton, Belmont, Brisbane, Burlingame, Colma, Daly City, East Palo Alto, Foster City, Half Moon Bay, Hillsborough, Los Altos, Los Altos Hills, Menlo Park, Millbrae, Mountain View, Palo Alto, Pacifica, Portola Valley, Redwood City, Redwood Shores, San Bruno, San Carlos, San Mateo, South San Francisco and Woodside. South Bay - Silicon Valley - Santa Clara County, San Jose, Santa Clara, Milpitas, Cupertino, Sunnyvale, Saratoga, Campbell, Los Gatos, Morgan Hill, Gilroy, Los Altos, Los Altos Hills. North Bay - Marin County, Napa County, Sonoma County, and Solano County, Belvedere, Corte Madera, Fairfax, Inverness, Kentfield, Larkspur, Greenbrae, Marin City, Mill Valley, Novato, San Anselmo, San Geronimo, San Rafael, Lucas Valley-Marinwood, Terra Linda, Sausalito, Tiburon, Rohnert Park, Santa Rosa, Petaluma, Windsor, Sebastopol, American Canyon, Calistoga, Napa, St. Helena, Yountville, Ross, Cloverdale, Cotati, Healdsburg, Sonoma, Benicia, Dixon, Fairfield, Rio Vista, Vacaville, Vallejo and Sacramento. East Bay - Contra Costa County and Alameda County, Antioch, Brentwood, Clayton, Concord, Danville, El Cerrito, Hercules, Lafayette, Martinez, Moraga, Oakley, Orinda, Pinole, Pittsburg, Pleasant Hill, Richmond, San Pablo, San Ramon, Walnut Creek, Alameda, Albany, Berkeley, Dublin, Emeryville, Fremont, Hayward, Livermore, Newark, Oakland, Piedmont, Pleasanton, San Leandro, and Union City. Santa Cruz Capitola, Santa Cruz, Scotts Valley, Aptos, Ben Lomond, Boulder Creek, Felton, Soquel, and Watsonville. View our Contact Us page for directions and a Google Map. To request a FREE pickup, check out our Pickup and Delivery page. Thank you Scott and All at Audio Video Workshop for your help in taking all of my grandparents home movies and converting them over to 2 DVD’s for me and my family. I am grateful we are all able to view these with regularity and remember good times from the 1960’s and 1970’s. I never knew they took all of these home movies as all this film was in storage for so long after they passed on. Thank you for giving us this wonderful gift from our grandparents again. They did what I asked them to, combining two video tapes while enhancing one; the price felt right; I’m a happy customer. Open on Sundays — this can be handy. Sometimes a lag in returning calls. Sweet receptionist/front desk lady makes it all worthwhile. Very friendly and helpful even though they are so busy! Great service, friendly and cost effective! They converted a historic 60 year old phon o gram record in a CD of excellent quality. Will do more work with them! Really friendly and helpful staff!